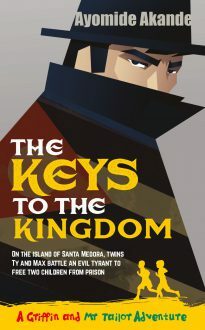 When twins Max and Ty Cramford receive a mysterious plea for help from a brother and sister claiming to be locked up in a Caribbean prison, they are inclined to ignore it – until a school trip to the tropical island of Santa Medora gives them a chance to investigate. They soon find themselves crawling through sewers and confronting the murderous henchmen of the evil President Pablo III in a desperate attempt to free the children who are the true heirs to the throne of Santa Medora. A thrilling and highly entertaining story for youngsters, teenagers and young adults alike by a talented young writer. Also by Ayomide Akande is the first book in this series, Griffin and Mr Tailor.